Did you miss our latest Pie with the Product Team? Joe, Product Project Manager at NeonCRM, went over a view of the key changes and explained how they can be used to save you time and raise efficiency. Click here to see a recording. Our improved account interface reduces scrolling, allowing NeonCRM users to move through their system more efficiently. Don’t worry — we’re keeping the features you love. We just made them much more user-friendly. Look forward to easier training and day-to-day use. We’d also like to note that with the launch of this update, we will be removing the “Go back to classic Neon” toggle. 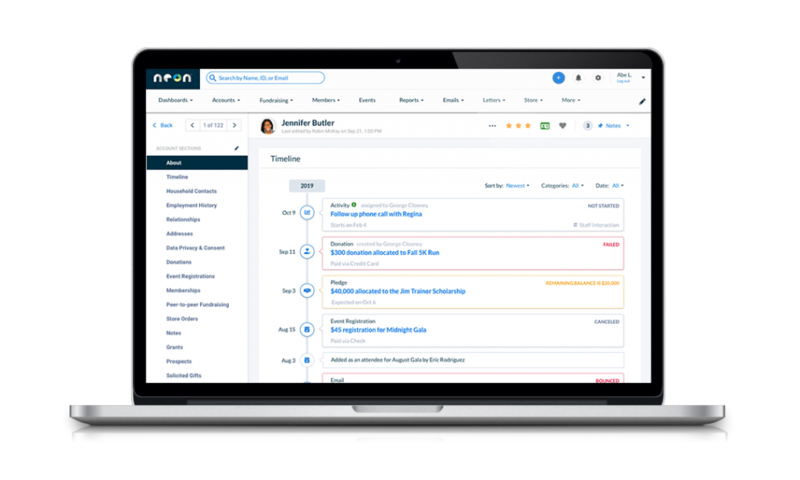 If you have not tested our updated navigation page, please do so soon to prepare yourself for all the exciting changes coming to your NeonCRM. A More Streamlined Overview: Account details can now be accessed through a new side navigation bar that cuts out extra scrolling. It’s never been easier to find exactly what you’re looking for. In-Line Editing: Accounts can now be edited section by section, allowing you to update contact data quickly and easily. At-a-Glance Information: Expandable information tables and rearrangeable contact profiles allow you to prioritize the information you need and access it fast. New Timeline View: Get an overview of constituent activity over time with our new timeline feature. We recommend that all users prep for this new launch by familiarizing themselves with our updated navigation user interface. Please keep an eye out for further announcements as we continue to make changes that create a consistent look, feel and functionality across all of NeonCRM. For an up-to-date listing of improvements, please see the Release Notes section in the Support Center.